Palaeoclimatology is the science of exploring records of past climate stored in natural archives, such as tree rings, lake sediment cores and ice cores. Past climate information is needed to place the human-induced climate changes we observe today in the longer term context of natural climate variability. Dendroclimatology is the science of exploring past climate information in tree rings, measurements of ring width, wood density and stable isotope variability are used to explore past climates. Trees are wonderful things! They take carbon from the air and water from the soil and combine them into sugars and wood tissue, and they record the passage of time faithfully as they do. In parts of the world with a seasonal climate, measurements from one tree ring can be assigned to one calendar year with absolute accuracy by comparing the patterns of the widths of the rings between trees. Moreover anyone who has ever grown crops or gardened will know that all plants, including trees, really care about the weather. Trees record the annual climate in the width, density and chemistry of their rings, using this evidence to explore past climates is the science of dendroclimatoloy. Exploring the physical and chemical changes trees undergo as atmospheric carbon dioxide levels rise. Because trees get the carbon they use to make sugars from the air their behaviour changes as the amount of carbon the atmosphere rises. 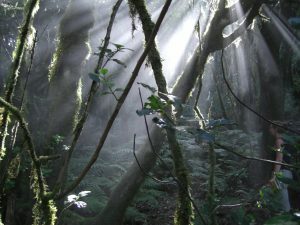 Most trees evolved when atmospheric carbon dioxide levels were much lower than today so they are able to use carbon dioxide very efficiently. We don’t fully understand how tree behaviour will change as carbon dioxide levels continue to rise. The record of carbon usage stored in the annual rings of trees allows us to explore this. 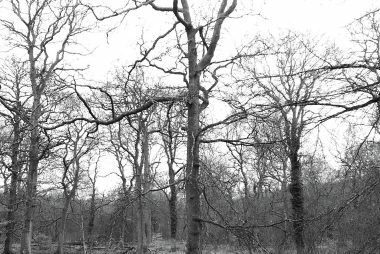 Oak decline syndromes are becoming more widespread in the UK, we are exploring tree growth histories to improve our understanding of the tee growth response to these complex disease syndromes to help the UK’s forestry charities and agencies manage affected sites. Climate change is the complicated expression of some beguilingly simple processes. It is something that almost everyone has an opinion on, because weather and climate affect us all. Understanding the scientific basis for what we know about climate change can feel like a mammoth task in a world where media coverage of climate can leap from one extreme to another. I have tried here to give a basic introduction to some climate science concepts and to offer a distinction between scientific questions about climate change and political ones. Explaining how, and why, greenhouse gas molecules cause heat to become trapped in our planet’s atmosphere is quite simple, you can see a straightforward demonstration of the greenhouse effect here. This simple effect was first understood in the early 19th century (a brief history of climate change). However, understanding how the additional energy trapped in the atmosphere by greenhouse gases translates into temperature changes on the surface of the earth could not be more complicated. It has taken decades for climate scientists to get to the point of understanding human-induced and natural climate variability. There is still a huge amount we don’t know, however, that does not mean the things that we do understand are incorrect. I am going to try to explain some of the things that we do understand about climate change. I am a climate scientist. For several decades I have worked on gathering evidence, in my case about the information on past climate stored in the annual rings of trees, questioning and analysing that evidence and developing theories to explain what I see, in the wider context of what other scientists see. Through that process I, again like the vast majority of climate scientists, have developed a detailed understanding of several things. There is overwhelming evidence that natural climate variable is large, and only partially controlled by changes in the amount of radiation our planet receives from the sun, and the amount of greenhouse gas coming from volcanic eruptions (you can read more about the other source of variability, the random unpredictable kind, here). The evidence (coming from past climate records and current climate measurements) for human induced climate change is unequivocal. This second theory is arrived at by understanding two things. First, the physics of what happens to greenhouse gas molecules in our atmosphere when they meet warmth (infrared radiation) rising from the surface of the planet (see above). This leads us to understand that the chemistry of our planet’s atmosphere controls its surface temperature and that human contributions to the atmosphere, from fossil fuel burning, are the only contributions which do not have a balancing processing locking that carbon safely back under the earth’s surface, where it can no longer warm the atmosphere. We are the only thing that puts greenhouse gases in to the atmosphere faster than nature is capable of taking it out (you can read more about the carbon dioxide bathtub here. However, I, again like most climate scientists, feel we still have a lot to learn about how the increase in greenhouse gas concentration of the atmosphere translates in to a specific temperature change on the surface of the earth, and how that average temperature change is felt in different places on the planet at different times. These questions are about how finding out how sensitive the surface temperature of the earth is to what goes on in the atmosphere (you can read more about climate sensitivity here). Understanding how the planet works is really complicated and simple black and white explanations are usually wrong. However, it is absolutely possible to reach a good, basic understanding of the climate system with a bit of reading. Some useful starting places are here and here. I would encourage everyone to learn a bit about climate science, with an important caveat. Climate science is about the physics of what happens when greenhouse gases meet radiation rising from the surface of the planet, and are added to the atmosphere, by us, at a faster rate than nature can remove them. Whilst an understanding of climate science may influence the choices we make in our daily lives, the two things should not be confused. Understanding the greenhouse effect will not help you understand the economics of the low carbon economy, or vice versa, and the two should not be confused. We are often given the impression, by those with a political voice, that developing a scientific understanding of how the climate works requires a particular economic and political world view. I can assure you that is not the case and I would encourage you to read scientific evidence about climate change with that understanding in mind. The greenhouse effect doesn’t care what car you drive, that decision is yours alone.